In my research, I discovered through old directories and census records that Ida McCain was the architect of the firm Spencer-McCain, and she was only 25 or so when she was here in Portland. Besides our house, I've found 10 houses they completed here in Portland (that haven't been torn down). In March 1912, this sentence was published in The Oregonian, ". . . the Spencer-McCain Company will build on seven lots [in Laurelhurst] this summer." I've identified maybe four of these houses, so there might be three more. Or maybe they just abandoned their plans for seven houses to return to California. Or maybe they didn't plan to build that many homes but said they were because they were trying to create interest; I'm trying to figure it out. So, I am irrationally going through lot-by-lot making an "inventory" of all the houses in Laurelhurst including the builders, when I can find the information at portlandmaps.com. (What an amazing resource we have!) This will also help to match up old photos when they only identify the owner (or builder) name. Oh, and since I'm taking over the Laurelhurst newsletter this spring, I should have some good material for history-based articles. At least I hope so. 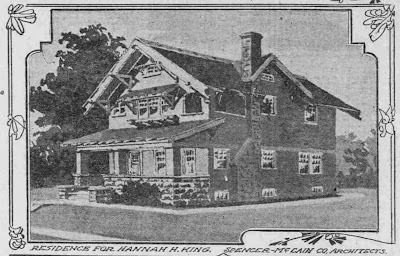 This is a concept drawing for a house they were planning to build for Hannah King, their mother, in Alameda Park. 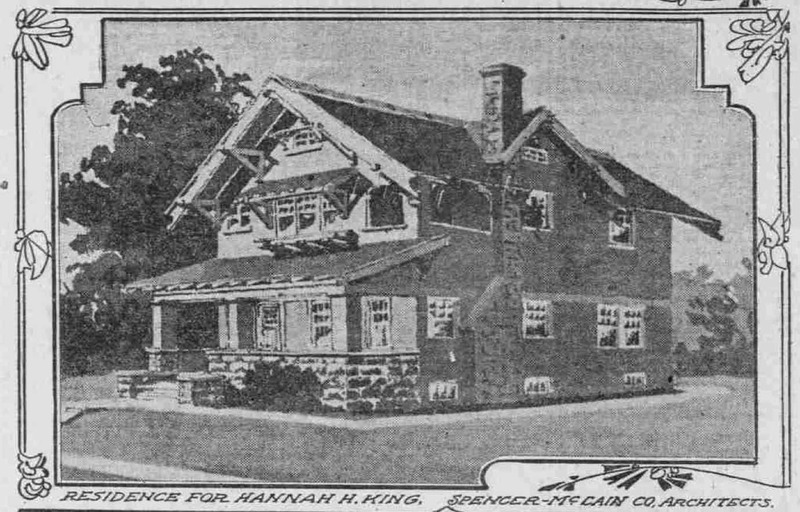 Though, I think they actually built it (or its twin) in Laurelhurst on Senate Street. Hello, I live in Colorado and post memorials on a website called FindAGrave.com. In the Virginiadale Community Church Cemetery is where Ida's father was buried; after he died Hannah her mother married George Kinbg. The family moved to San Francisco, California. One thing I found was her mother's Funeral Record of her cremation and lists one of her daughters as Mrs. Ida F. McCain. Her middle name was Florence according to the family bible, but unless she married a man with the same last name, I wonder if the "Mrs." was a mistake made by the funeral home? If you want more information on her brothers and sisters, just let me know and I will be happy to send you the information I have.